Listen carefully. This is not a book. It’s a masterpiece. Listen carefully. This doesn’t feel like a piece of fiction – it feels real. Listen carefully. This story will leave you numb. I think I still am. Listen carefully. This is not a test. It’s a review. When the world as we know it is suddenly shattered by the shrill screams of zombies, the human race is in chaos. No one knows how the deadly disease came about, but they all know it spreads. In this race for survival, six teenagers find themselves barricaded in their high school, living in constant fear of themselves, each other, and what lies outside. Ironically enough, Sloane, the narrator of this novel, despite being one of the six human teenagers left in her town, wants to die. Sloane’s abusive father has made her life hell and when her older sister, Lily, leaves Sloane behind to deal with him on her own, it’s more than she can handle. Yet, everyone thinks Sloane is a survivor when in reality, she has given up on life. Courtney Summer’s latest novel takes you into the mind of one victim as she struggles to come to terms with the horror that raids her world, the futility of life, and the true meaning of being alive. I am going to start out by apologizing because nothing I possibly say will even come close to the sheer perfection, brilliance, beauty, and haunting aftermath of this novel. 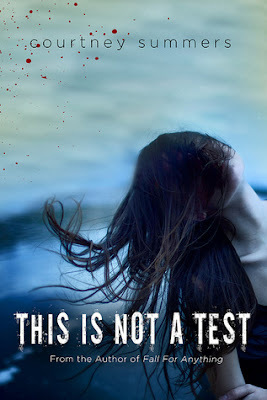 This is Not a Test is my first Courtney Summers book and if her other novels are anything like this one, it most certainly won’t be my last. In all honesty, This is Not a Test is not a zombie novel. I know, it’s shocking. Although there are plenty of zombies in this novel and more than a few close run-ins with these scary undead creatures, I would not go so far as to write off This is Not a Test as being just another zombie novel. In fact, if I had to pinpoint one specific genre for this book, I’d most likely tell you it was a psychological thriller. This is Not a Test is told from the POV of Sloane whose voice is raw, brutal, and fresh with pain. Sloane, like the other teenagers she is with, is confused and worried about the new turn of events that have wrecked her life, but not for the same reason as the others. Sloane’s emotions are often difficult to explain as they are confused, jumbled, and so very realistically. Summers writes in such a way that you can feel your heart crying for Sloane, your blood freezing over as the zombies bang against the walls of the school, and your brain screaming when the tensions between these six reach a breaking point. More than anything else, what Summers has truly done is attempt to see in what direction human nature would turn when faced with this situation. In my opinion, I feel as if she has done a remarkable job. I loved each and every one of these characters and the role they played throughout the novel and especially in Sloane’s life was heart-breakingly brilliant. I’m not sure if you’ve picked up on this or not, but I am being purposely vague. I finished this novel three nights ago but I am still finding it excruciatingly difficult to put into words just why this novel was so incredible. I went into this book with no expectations, no knowledge of what it would be about, and no idea about the type of writing I would come across and that, in my opinion, made this experience all the more real. I say experience because This is Not a Test truly is an experience. Sloane’s narration draws you into the story so that you forget your own name and past and recall only that of Sloane’s. It is a powerful and effective method of writing and I think what shocked me the most about this novel was that it wasn’t just mindless zombie entertainment – it had a much deeper, much more raw and personal message than could originally be understood. Summers truly dug deep into the mind of a teenager who wished to end her life, of two twins who watched their parents die before them, of a young boy who was responsible for death and she turned that into a haunting tale on humanity. If nothing else, Summers has mostly certainly accomplished what she set out to do – create an impactful story on the power, gift, and future of humanity. Once again, I really must apologize for this review. I have sat down at my computer at least a dozen times over the past few days and agonized over how to write this and I still don’t know. There is so much I can say about this book and even if it isn’t a spoiler, I fear it will ruin the experience. Summers really should coin the term “a gripping read” as This is Not a Test is impossible to tear your eyes away from. I have never read a narration quite like Sloane’s before and much like a horror film that you know will scar you, Sloane’s voice is impossible to turn away from even though you know it will linger with you forever. I honestly feel as if there is a part of Sloane – her confusion, betrayal, anger, pain, despair – within me forever. In my opinion, that is the true mark of a phenomenal writer. I cannot say it enough - This is Not a Test is a true literary masterpiece. It is the type of novel that begs you to read it slowly, forces you to think about every line, and that ultimately leaves you feeling as if you’ve morphed into a stronger person overnight. It is truly a novel that will linger in your mind for days – if not weeks and months – to come. In fact, the only emotion I should summon up after finishing it was shock at what I’d read and a large dose of admiration. Wherever you are Courtney Summers, I applaud you. Listen carefully. You must read this book. If it’s the last thing you do, I implore you to read it. It will change your outlook on life and completely astound you. Listen carefully. This is not a test. It’s a request. Anyways, I've read This Is Not A Test, and while I liked it, I didn't love it as much as you did. Sloane's voice came off as a bit annoying to me, and that ending had me confused!! Although, I really did love the zombies. I totally agree, they freaked me out, especially when they were banging on the doors and all that. Such a wonderful review!! I love how you said everything, you are making me want to reread This Is Not A Test to see if I like it better.